For other uses, see Kyle (disambiguation). Kyle Thomas Harvey (born May 18, 1993), better known mononymously as Kyle (formerly known as K.i.D, an acronym for Kyle is Determined), is an American rapper, singer, songwriter, and actor from Ventura, California. He is best known for his breakout single "iSpy", featuring American hip-hop artist Lil Yachty. Kyle is signed to Indie-Pop and Atlantic Records. He is also known for his association with the SuperDuperCrew which consists of Brick, Jesus, and Maxx. 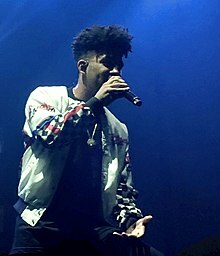 Kyle has collaborated with artists such as Kehlani, Lil Yachty, G-Eazy, Chance the Rapper, Miguel, MadeinTYO, Yuna, Ty Dolla Sign, and among others. Some of his songs in addition to "iSpy", include "Keep It Real", "Doubt It", "King Wavy" and his 2018 hit single "Playinwitme". In 2015, Rolling Stone named him as "one of the ten artists you need to know". Kyle's debut studio album Light of Mine was released in 2018 to positive reviews and was commercially successful. Kyle was inspired by many various artists and bands from Nirvana to Chief Keef. Kyle starred in the 2018 Netflix original film The After Party. He also released the track from the film "Moment" featuring Wiz Khalifa. Kyle Harvey was born in the Reseda neighborhood of Los Angeles, to a single mother, in a home of eight family members and two siblings. He grew up one hour away in Ventura, California. He stated that he has a speech impediment and that during his youth he was bullied because of it. Kyle attended Ventura High School and regularly took part in drama classes which helped his confidence largely. He started singing at the age of six and was writing and performing his own songs by elementary school. Harvey started rapping when he was about 13 years old and began recording music after hearing Kid Cudi's Man on the Moon. Harvey's first songs were recorded on PreSonus' Studio One recording software using his aunt's computer while in high school. Kyle started releasing mixtapes such as Senior Year, Second Semester, FxL, Super Duper, and K.i.D under the moniker KiddKash and K.i.D. starting in 2010, and in 2013 released Beautiful Loser. In May 2014, he was featured in G-Eazy's music video for "I Mean It" as a technical director on the fictional news set. In October 2015, he released his follow up commercial mixtape Smyle. Kyle's first music video to reach one million views was Keep it Real, which was accomplished later that year. In March 2018, alongside the release of his single "Playinwitme" featuring Kehlani, Kyle announced that Khalid would be featured on a track titled "iMissMe". Kyle's debut studio album Light of Mine was released on May 18, 2018. The album debuted at number 29 on the Billboard 200. He appeared as the main character in the Netflix original film, The After Party which debuted on August 24, 2018. ^ a b "KYLE Signs to Atlantic Records – Fashionably-Early". fashionably-early.com. February 7, 2017. Retrieved June 2, 2017. ^ ""ISpy" - KYLE ft. Lil Yachty". Artistic Manifesto. Retrieved January 12, 2017. ^ "Kyle and Lil Yachty Ignore the Haters in "iSpy"". XXL. Retrieved January 10, 2017. ^ "Kyle & Lil Yachty – "iSpy"". HYPEBEAST. Retrieved January 10, 2017. ^ "10 New Artists You Need to Know Now". Rolling Stone. Retrieved February 16, 2017. ^ a b c d "Meet Kyle, the "iSpy" MC Who Wants to Be Rap's John Lennon". Rolling Stone. Retrieved 2017-10-01. ^ a b "Kyle Is Rapping and Playing It Safe". vice.com. December 3, 2014. Retrieved February 2, 2017. ^ "K.i.D". K.i.D. Retrieved June 2, 2017. ^ "Bout to Blow: 10 Dope New Songs You Should Be Hearing Everywhere Soon". Complex. January 3, 2017. Retrieved January 10, 2017. ^ "Kyle – Chart history" Canadian Hot 100 for Kyle". Billboard. Retrieved May 13, 2017. ^ "Kyle – Chart history" Billboard Hot 100 for Kyle". Billboard. Retrieved January 31, 2017. ^ "New Music: KYLE feat. Kehlani – 'Playinwitme'". Rap-Up. March 20, 2018. Retrieved March 21, 2018.